Your movie-viewing experience is about to get a whole lot more epic and you don’t even have to go to town for it. Cathay Cineplexes launched its largest suburban outlet and the largest in western Singapore at shopping mall JEM at the tail end of November. Boasting brand-new seating options, first-class movie experiences and high-definition viewing with the latest surround sound technology, Cathay’s latest foray into the heartlands is the most adventurous yet. 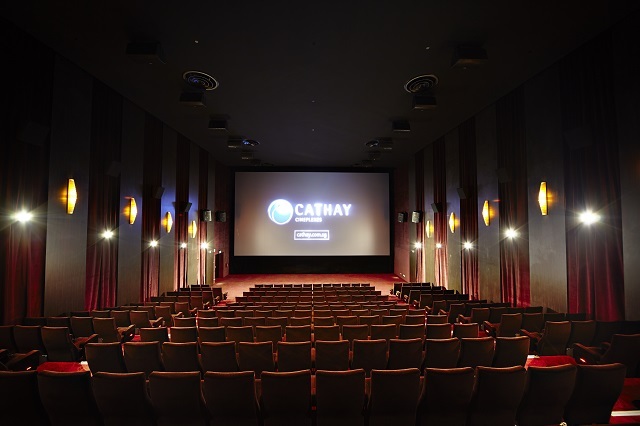 With 10 screens and 1,600 seats, Cathay boasts the largest number of screens in Singapore’s west by a single operator, if you count West Mall’s six screens. (Cathay Organisations Holdings CEO Suhaimi Rafdi said other operators had six screens with less than 1,000 seats in the suburban branches.) But the numbers game aside, Cathay JEM is not skimping on providing just another typical suburban movie-viewing night. Take for example, the new Digital Xtreme hall, a new cinema class by Cathay. The larger wall-to-wall cinema screen at 13.6 metres by 7.3 metres does make a difference — viewing the screen even from the back row is satisfying and immersive. Leg room is also greater, so the 1.2-metre allowance ensures you’ll never kick the seat in front of you. But the biggest difference is in the new Dolby Atmos technology, with 42 speakers fitted around the hall for true surround sound. Guess what: there are speakers on the ceiling too, so you can actually hear thunder, airplanes’ engines or raindrops as authentic as it is in real-life. The back speakers are the big draw here (we actually thought crickets were passing behind us), although by the looks of the Dolby Atmos movies out there, this aspect of sound is rarely used. Currently, The Hunger Games and The Hobbit’s sequels use Dolby Atmos. Upcoming movies include Rio 2, X-Men: Days of Future Past and the upcoming Hercules movie, which we thought used Atmos technology to the fullest. For all you lovey-dovey couples out there — gay or straight, of course — Cathay’s new Ultima couple seats ensure comfort without having to sit in individual chairs. We all know how awkward that feels, trying to reach for the other half’s hand over the armrest. It is also bigger than the couple seats that occupy the last two rows of cinema halls. How big? It can fit 2 adults and 1 child, just in case you decide to heed the government’s call for MOAR BEBIZZZ. But if you’re really searching for a classy movie experience, Cathay has brought over its Platinum Movie Suites concept to JEM, becoming its first heartland branch to receive the premium concept. 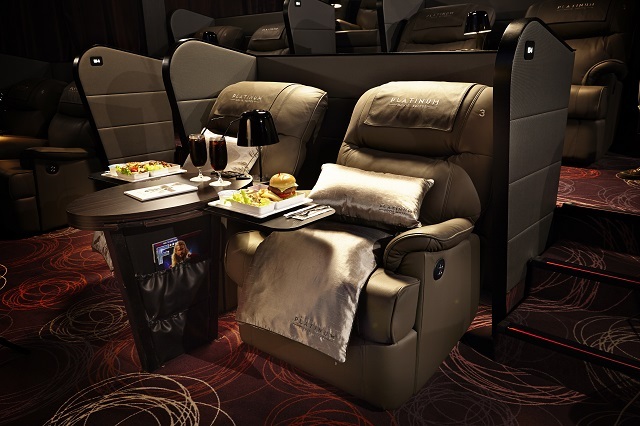 $150 for 2 people gets you the movie dining experience on Saturday nights: check-in to the lounge with food, drinks, free Wi-Fi and iPads, then enjoy a meal on the cinema hall’s recliners (there’s free Wi-Fi in the Platinum halls too) before watching your movie, with butler service at your call. We’re pretty pleased with the seat pitch and leg room of the recliners; at maximum recline, once can still watch the movie comfortably. Just don’t doze off, playa. All the frills aside, if you are here just as a normal patron, Cathay has put in much thought into your experience. 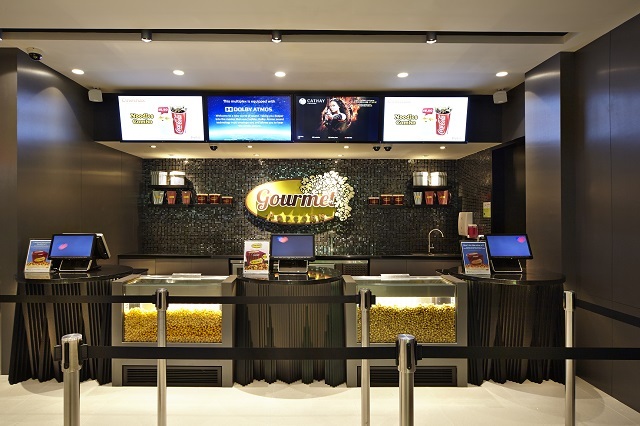 When you queue up to buy popcorn, you can also pay for your tickets at the same time. No double-queueing frustrations there. Also, there is a gourmet popcorn kiosk for all you Garrett fanatics to chomp down on caramel or cheddar cheese popcorn. Best part: you can just buy the popcorn, just like a trip to Garrett’s. Neat. The company plans to launch self-service kiosks in the first quarter of next year. This will allow cinema patrons to buy their own movie tickets, pay cash to the kiosk and collect tickets and change without the help of an extra human. Mr Suhaimi said that this would reduce workforce by half, as companies face a tight labour crunch. 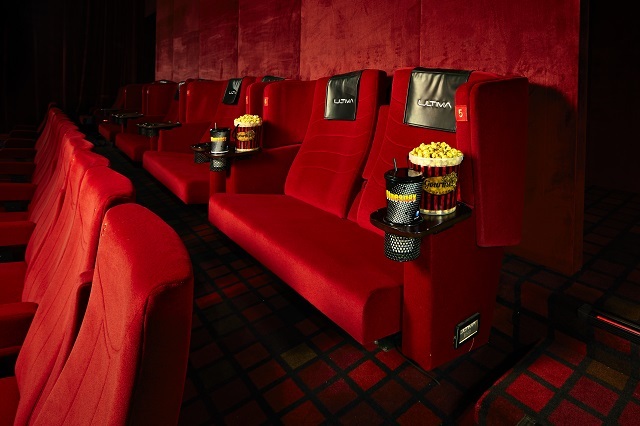 With all these additions to Cathay JEM, we think we found our new favourite movie spot. Introductory prices per ticket for Cathay JEM’s Platinum Movie Suites are $18 (Mon-Thu), $28 (Fri & Sun, incl. eve of PH & PH) and $38 (Sat). Students and senior citizens’ prices are $16 for 2 tickets (Mon-Thu for screenings below 6pm). Offer ends 31st December and is only valid for walk-in purchase for current day bookings, limited for 4 tickets per customer.